The internet offers us all sorts of information, resources, and even community, but here at STC Craft we're still big fans of a good, old-fashioned meetups. Whether we're hanging out with our friends and knitting at a coffee shop, taking a class at a local craft store, or attending a more formal event like VK Live or Alt Design Summit, we're just crazy about that face-to-face interaction with creative people. So, we were thrilled to hear about Craftcation, a new event happening March 22-23 in Ventura, California. The brainchild of Nicole Stevenson and Delilah Snell, Craftcation is a sure-to-be-inspiring conference for indie craft business owners who want to grow and maintain their businesses while building new skills. Tending to both the right and left sides of the brain, events on the schedule include business lectures and panels on marketing, social media, legal issues, and accounting, as well as hands-on workshops in subjects like sewing, canning and preserving, cooking, paper arts, and embroidery. 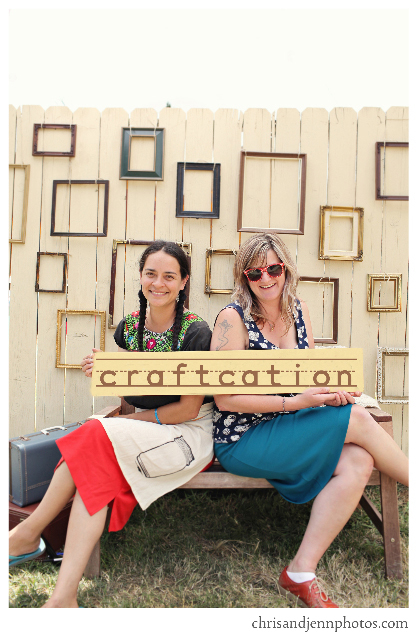 What inspired you to host Craftcation? How long have you been working on it? When I started my own handmade business Random Nicole, eleven years ago in Los Angeles The Handmade Movement didn’t exist the way it does now. There were lots of people creating things in makeshift kitchen or dining room home ‘studios.’ Indie craft shows hadn’t surfaced yet. When I would meet a fellow maker at a farmer’s market, flea market, or church craft show where we were selling we would frantically exchange information on suppliers, places to sell, and the business side of crafting. I started Patchwork Indie Arts & Crafts Festival in 2007 with my aunt and business partner Delilah Snell to provide a venue for emerging makers to showcase their goods. At our Patchwork shows Delilah and I noticed that same frenetic information-sharing between crafters that I’d engaged in when I began Random Nicole. We saw a need for an event bringing makers together to connect and share information. Delilah and I were in Ventura last August scouting future Patchwork locations. We both realized that Ventura was the perfect spot for our dream event, an indie business and DIY conference and Craftcation was born. Since August, Craftcation has pretty much taken over our lives. Why do you think so many people are interested in developing craft-related businesses right now? People are moving towards a more conscious way of living. We’re more aware of the impact our individual choices make on the world around us. We’re asking questions previous generations didn’t ask. How does buying a product made overseas affect our local economy? What materials are used to make the things we purchase and are those materials harmful for us or our environment? How is our food sourced and grown? Every single thing we spend our dollars on reflects our personal philosophies. Although we are in a recession many people don’t mind paying a little more for something if it’s organic or local. We’re beginning to live with less waste, which means maybe we don’t want to spend $40 on 3 T-shirts made overseas that may not stand the test of time but do want to spend $40 on ONE T-shirt that is made from sustainable bamboo, screen-printed with soy ink. and sewn by someone who lives in our town. Value is returning to handmade goods as well as to our time. Technology has not only made the world ‘smaller’ but also made business more accessible. Anyone can go online and order business cards, open up a shop on Etsy, create a website or blog or learn how to sew. The internet has made it so simple for anyone to gain skills and put themselves out there. The return to handmade things stems from this new way of living consciously coupled with convenient access to the tools people need to make, buy and sell things. How did you choose the people who are speaking and teaching classes? I connected with so many inspiring makers in my eleven years on the craft show circuit and through teaching classes at the brick and mortar studio/shop the craft kitchen that I owned. Delilah forged relationships through her eco-shop The Road Less Traveled, teaching workshops and her involvement in the Southern California food scene. Our seven years producing Patchwork also led to some lasting connections. We put together a list of everyone who we wanted to share their expertise with attendees at Craftcation and began sending emails. Response from these craftelbrities was overwhelming and we’re proud to have industry leaders like Jenny Hart (Sublime Sticthing), Kathy Cano-Murillo (Crafty Chica), Cathy Callahan (Cathy of California), Evan Kleiman (KCRW’s Good Food), Aida Mollenkamp (host on The Food Network and The Cooking Channel) and 30+ more presenters. What do you most hope attendees will get out the experience? I want attendees to gain a better understanding of the business aspects of what they do and be able to implement what they learn into starting or growing their indie businesses. Garnering a sense of community with their peers and making lasting connections is also important. Building upon skills they already hold and learning new things in the hands-on craft workshops is fundamental to the Craftcation experience. Running your own business usually means working twice as hard for less money than if you worked for someone else, so I also hope attendees unwind and have fun at our community events like the BBQ Social, Happy Hour Meet & Greet, morning yoga, and '80s Dance Party. How do you suggest that Craftcation attendees prepare themselves in advance so that they'll be able to get the most out of the experience? Bring lots of business cards, a sample of your work, and be ready to take tons of notes. Research the presenters beforehand and prepare questions to ask them. This is an amazing opportunity to connect with leading industry professionals. Think about areas where you need help and outline what you want to learn so you can pick which workshops fit your needs. Bring clothes for cool nights and warm days, a banana clip and some leg warmers for the '80s dance party, and a bathing suit (the hotel is steps from the beach). For more information about Craftcation visit www.craftcationconference.com and get Craftcation updates on Facebook and Twitter.